An African conservationist who set up a reserve to help endangered chimpanzees has been honoured in Leicestershire. 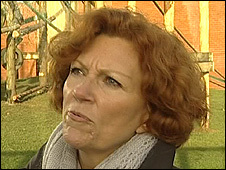 Claudine Andre, founder of the Lola Ya Bonobo sanctuary, was given an award for primate conservation by the Twycross Zoo. The collection of chimpanzees or bonobos at Twycross Zoo is the most important outside Africa. Her sanctuary is located just outside Kinshasa in the Democratic Republic of Congo. 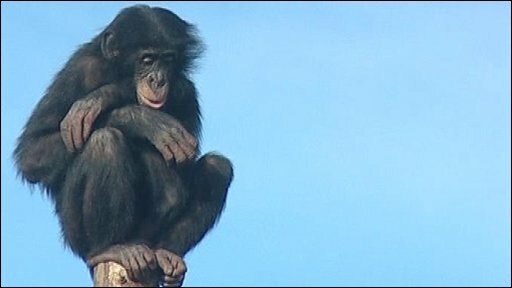 The Twycross Zoo on the Leicestershire-Warwickshire border, is the only zoo in the UK with bonobos. The bonobo is only found in the wild in an area south of the Congo River, but a dozen of them are also at Twycross Zoo. The African bonobos are under threat as many are hunted and killed for bush meat. Ms Andre said: "Baby bonobos refuse to survive without the mother - they have only one goal - to die - because they cannot live without love." The bonobo shares 99.6% of its DNA structure with humans, but is under threat from hunters and from habitat destruction, she said. There are 57 bonobos at the rescue centre in the Congo and 128 in captivity around the world. The total population is estimated at between 5,000 to 20,000.